Discover our Selection of Antique Onyx Rings, Estate Onyx Rings, Vintage Onyx Rings and Modern Onyx Rings. For a Custom Onyx Ring Design Click Here. Onyx is a Form of Agate, Most Popular For its Black Variety. 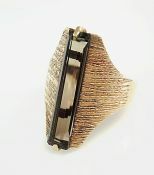 A beautiful mid century modern 10kt textured yellow gold ring featuring 1 emerald cut medium brown smoky quartz, est. 2.91ct. 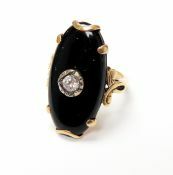 14kt yellow and white gold ring with 1 bezel-set flat cushion cabochon black onyx, est. 2.78ct. 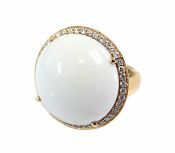 10kt yellow and white gold ring with 1 bead-set diamond, est. 0.02ct (clarity: VS & colour: H-I) set within a polished curved piece of onyx. One 14 karat yellow and white gold ring. One rectangle onyx. One old European cut diamond (0.16 carats: SI1 clarity: H-I colour). One 14 karat yellow gold ring. One cabochon onyx. Fourteen round brilliant cut diamonds (0.28 carats: SI clarity: G-H colour).